22.01: The press bench shares the wall with the Camden Centre next door, where there sounds like a right ‘ol party going on. Music and cheering and some more cheering. But this is where it’s really been at. The budget set. A bit of political point-scoring, natch. A sort of non-debate on Fitzrovia. A lot of recorded votes. All done for tonight, though. They’ll do it all again in April. 21.45: West Hampstead heads: The empty council building at 156 West End Lane. Lib Dems have asked Labour how much money has been spent on it since it became vacant. Drum roll… it’s £28,471.68. Most of that is billed by a security firm which patrols it twice daily and twice nightly to stop it getting squatted. @RichardOsley that number sounds low compared to what we were told it was costing last year. 21.32: Only half an hour until lemonade. 21.25: There was meant to be a discussion about the future of Fitzrovia over this last half an hour. It’s been a right mess. The opposition had a flood of emails over the weekend about the Dickens workhouse, which the Labour lot didn’t get. The opposition wanted to delay the debate on these grounds and Labour said it was all too late and that the Lib Dems and Tories had not shown any interest in Fitzrovia before. A bit bizarrely, Labour councillor Maeve McCormack said one of the emails came from “somebody who appears to be a Daily Mail journalist and the Daily Mail do not generally like Labour policies”. So, all a mess – and deputy mayor Councillor Lazzaro Pietragnoli kinda sums it up, handing the gavel over and wryly telling the room: ‘I’m happy to give the chair back to the Mayor’. 21.15: Almost 20 minutes so far for the politicians here discussing whether or not to discuss the future of a Dickensian workhouse in Fitzrovia (and the rest of the area)… a fact in itself which Dickens would’ve surely appreciated. The big disappointment is that long-serving Labour councillor Julian Fulbrook, the man with a million literary quotes, has not name-checked an obscure character from Barnaby Rudge or The Pickwick Papers yet. @RichardOsley I wanted to answer the slightly longer: #qtwtain. But the borough solicitor said it didn't answer the question. 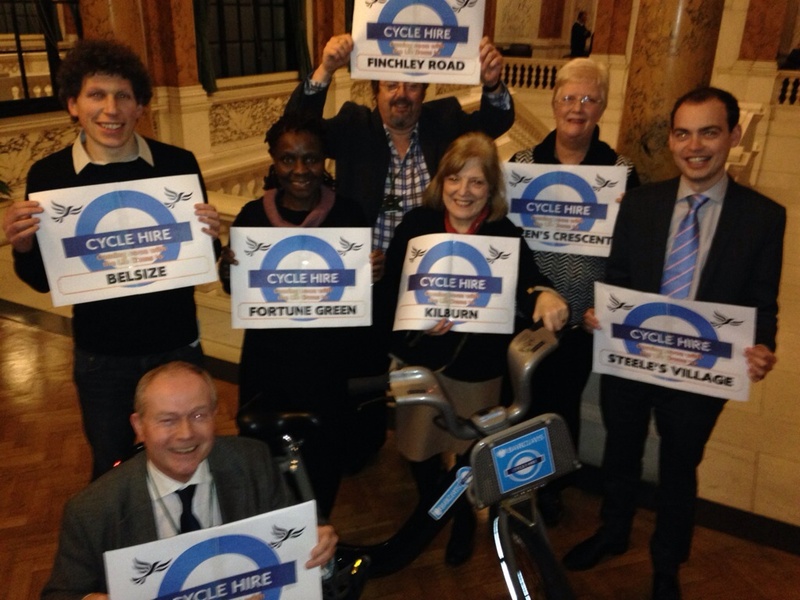 20.59: Cast your minds way back when to the update at 20.01 and some sort of thing between Labour’s Mike Katz and the Lib Dems, revealed in a tweet from Thomas Gardiner… Here’s the photo-shoot with the Boris Bike where it happened. Apparently, Mike made some sort of joke about there being a lot of Tory blue on the posters. Lib Dems were in fact promising to expand the city’s cycle hire scheme northwards in their budget… Good luck, by the way, to anyone cycling up Haverstock Hill on a three gear Boris Bike. There should be an annual championship for that. 20.47: Recorded vote count-up. This is where Labour majority outflanks the opposition councillors and its budget gets through, while suggested amendments from the other side fall. “Tweet that to Pickles,” heckles T-Money. It’s like having the school register read out three times. Talk among yourselves. 20.42: T-Money has been quite angry by the public art stuff. It’s £130,000 on new pieces for the new council headquarters in King’s Cross. His reply is that Lib Dems spent £60,000 on art at the refurbished Prince of Wales Baths in Kentish Town. 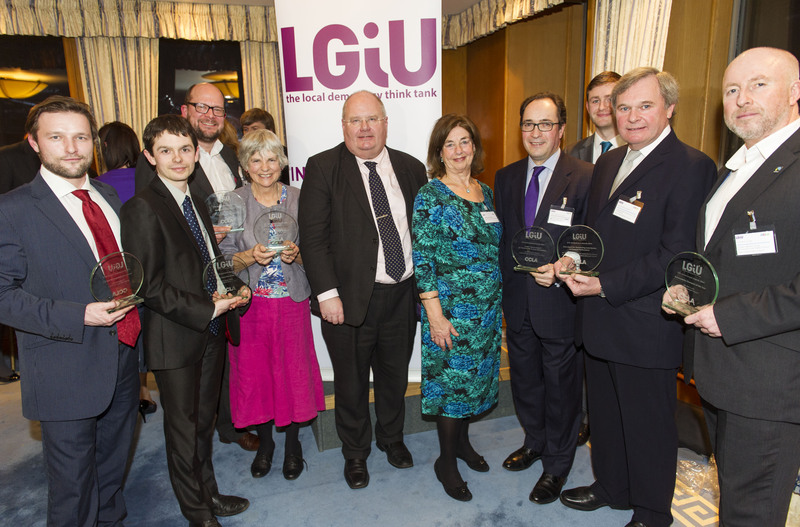 20.29: Conservative Gio Spinella warns Labour against bagging Eric Pickles here tonight… on the grounds that T-Money didn’t look so displeased to be in the big man’s company last week, while picking up a LGIU award for digital innovation stuff. TM’s Cheshire cat grin can be seen here, third from left. 20.26: More national politics to-and-fro. Lib Dem Matt Sanders: “It has taken a strong coalition government to fix this economic mess.” Later calls the council “stupid” and “silly” for cuts to street cleaning. 20.15: We used to live-tweet these council meetings from the New Journal Twitter account, feeling that we were adding something to local democracy. Instantly lost followers. They came back when we tweeted a picture of a cat rescued from the Swiss Cottage gyratory. What’s a hack to do? 20.10: Labour’s environment supremo Councillor Phil Jones says he hates talking about which party would cut more… before launching into : “Of course there would have been cuts if there had been a Labour government, but local government wouldn’t have been offered up sacrificially, like has been done by Eric Pickles to George Osborne”. 20.01: So, what happened in the corridors before this meeting started? A tweet from Labour councillor Thomas Gardiner. All I saw was lots of Lib Dems crowding around a Boris Bike and having their picture taken. 19.59: More from CLL, the presidentially cool way of saying Councillor Claire-Louise Leyland, the Conservative leader. She calls for more cross-party work on people trafficking, initially kickstarted by former Hampstead councillor Kirsty Roberts. 19.53: Jonny Bucknell is on his feet, which is good news in itself…. following his ‘sailing accident’. 19.51: Here’s that time Russell Eagling brought his rubber gloves (just in case you didn’t know what post at 19.36 was about. He claimed Labour was washing its hands of the responsibility for cuts. Geddit? 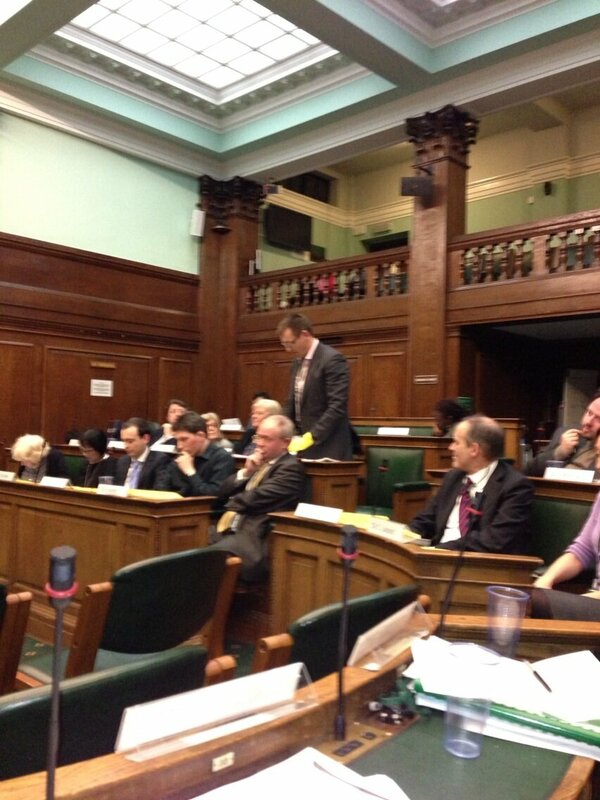 19.48: Camden’s only Green councillor Maya De Souza’s turn. The Greens have previously called for a referendum on whether council tax should go up on the same day as May’s council elections. @RichardOsley Green proposals are for saving vital services vital for community, support 4 high street/small business, and invest to save. 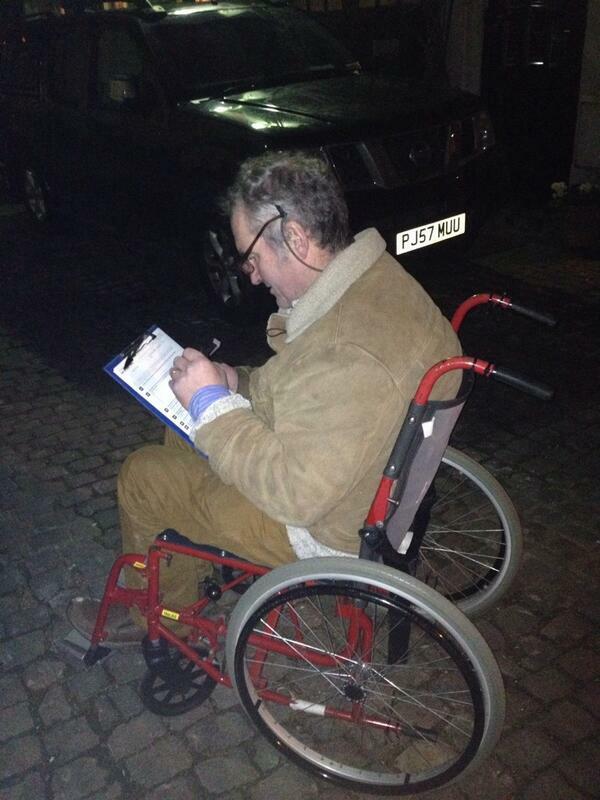 19.44: Former Tory leader Andrew Mennear – he’s seen a few full council meetings – now on his feet. Gets told by T-Money that his amendment won’t be supported because he doesn’t want to see a “Westminster-Council style council”. I’ve only ever been to one Westminster Council meeting, the bumper majority towards the Tories over there makes it, let’s say, a little one-sided. 19.36: Lib Dem councillor Russell Eagling, sans his famous rubber gloves, is unimpressed that more money is being spent on “backroom” strategy room. References Camden paying extra fees on former interim children’s services department Helen McMullen’s 210-mile commute from Hull and accommodation for her in London. Last budget for Russell, he stands down in May. 19.32: Lib Dem leader Keith Moffitt accuses T-Money and Labour of ‘saving up cuts’ until the other side of the elections in May. Says it is the first budget since last elections without significant cuts. 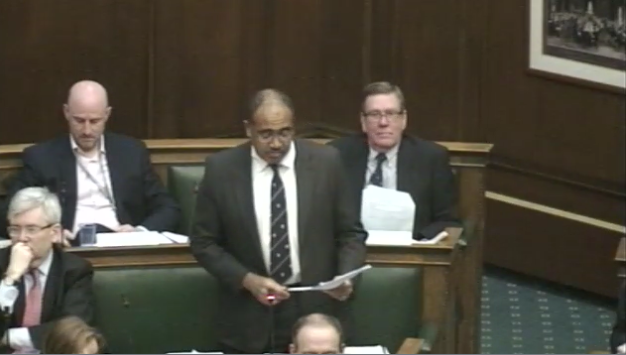 “There is far too much waste in this council”, he says, promising the council mag will be cut to four issues a year under the Lib Dem amendment. 19.20: Camden leader Sarah Hayward returns, describing Keith as “quite pathetic” for the line about reading out letters – due to the subject of the letter she had written to Ms May. On the office switcharoo in King’s Cross, she adds: “I’m proud of what we’ve been able to deliver from our capital programme. 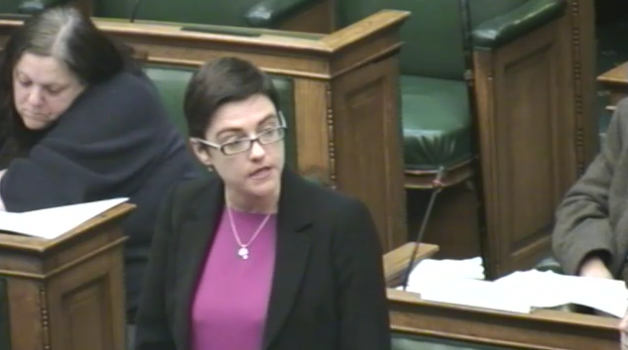 19.13: Lib Dem leader of the opposition Keith Moffitt criticising council leader Sarah Hayward for “reading out letters” – she had written to Home Secretary Theresa May about the visit to London of Hungary’s hard-right Jobbik party – rather than making a speech last time we had here. He calls it a ‘wheeze’. Then attacks council for failing people with simple problems who call the Town Hall but get bad service. 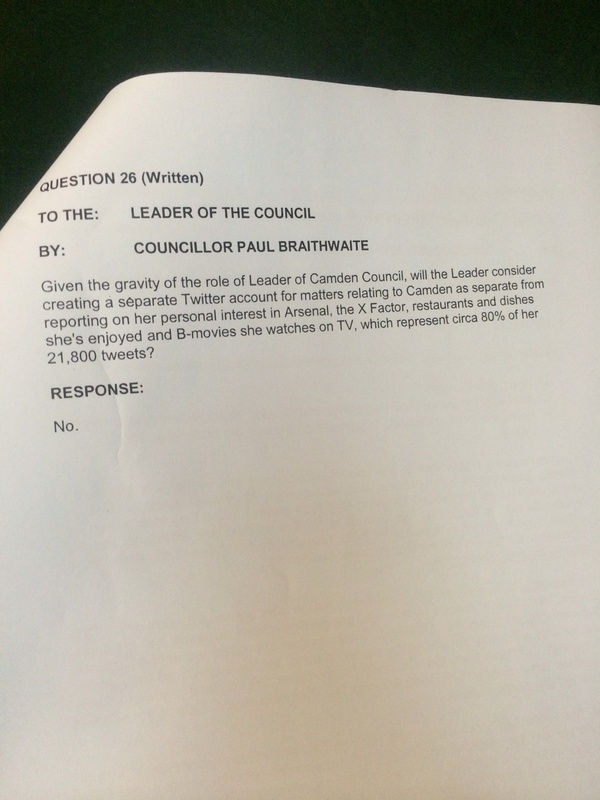 19.05: Liberal Democrat leader Keith Moffitt announces that Camden’s cycling champion Councillor Paul Braithwaite has had a collision on his bike at a cycling event in South Africa. He is recovering but a picture of his injuries he has sent to Keith is too wincing to share. Everybody agrees to wish him well. 19:01: The Mayor arrives. Off and running for council meeting. Tonight, Camden is setting its budget for another year. Nine people in the public gallery. Millions watching back home and across the world on the webcast. West Hampstead Life | What have I missed since March 3rd?